In New York, title to real property can be transferred from one party to another by executing a bargain and sale deed with covenant against grantor. This type of deed is statutory under NY Real Prop. Law Section 258 Statutory Form C.
A bargain and sale deed with covenant conveys whatever interest the grantor holds in the property at the time of execution, with the promise that the grantor "has not done or suffered anything whereby the said premises have been incumbered in any way whatever" (NY Real Prop. Law Section 258 (Statutory Form C)). There are two types of bargain and sale deeds in New York. One type contains a specific covenant against grantor's acts, while the other does not. Bargain and sale deeds with covenant provide more surety because they guarantee that the property conveyed is without encumbrances made by the grantor. Bargain and sale deeds provide less surety than a deed with full covenants (Statutory Form A), which offers the fullest surety of title because its warranty covers the entire ownership history, even preceding the time the grantor obtained title. A lawful bargain and sale deed with covenant must meet all state and local standards for recorded documents, including the grantor's full name, mailing address, and marital status; the consideration given for the transfer; and the grantee's full name, mailing address, marital status, and vesting. Vesting describes how the grantee holds title to the property. Generally, real property is owned in either sole ownership or in co-ownership. 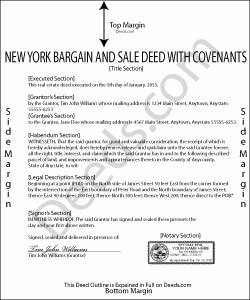 As with any conveyance of realty, a bargain and sale deed with covenant requires a complete legal description of the parcel, including the section, block, lot, and unit numbers. Recite the prior deed reference to maintain a clear chain of title, and detail any restrictions associated with the property. Sign the deed in the presence of a notary public or other authorized official. For a valid transfer, record the deed at the county clerk's office in the county where the property is located. Most counties in New York require a recording page to accompany all documents for recording. This cover page is available on the local county clerk's website, and it factors into the total page count when calculating recording fees. This article is provided for informational purposes only and is not a substitute for legal advice. Speak to an attorney with questions about bargain and sale deeds with covenant or for any other issues related to transfers of real property in New York.